Ireland's Under-21s are out of contention to nick a European Championship play-off spot with a game to spare after Israel inflicted defeat on Noel King's side in Akko. 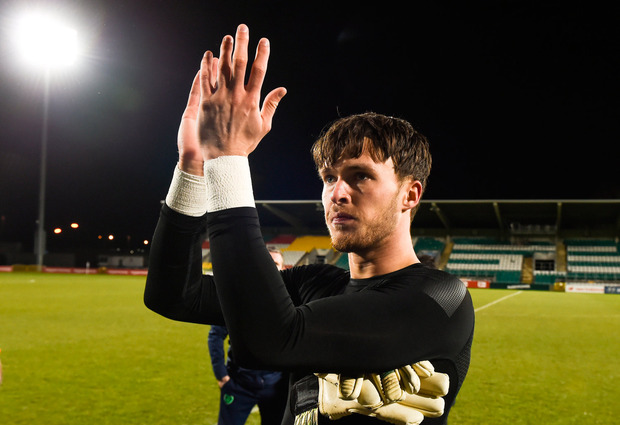 Kieran O'Hara has established himself as Ireland's first-choice goalkeeper during the campaign but the Manchester United stopper was at fault for the winner 13 minutes from the end by allowing Maxim Plakushchenko's dinked cross evade him in the air. Chasing the game late on, Ireland were caught on the counter to concede a third in the sixth minutes of injury time. Earlier in the second half, Derry City striker Ronan Hale was only on the pitch five minutes before he pounced on 64 minutes to cancel out Gavriel Kanichowsky 15th-minute opener. After only picking up a point from last month's double-header against Kosovo and table-toppers Germany, King's crew required a maximum six points from their concluding couple of games. They now head to Heidenheim on Tuesday for what will be a victory parade for Germany once they avoid defeat against Norway on Friday. King replaced the suspended Shaun Donnellan with Ryan Delaney at centre-back the defence was tested from the outset. Israel got their deserved opener when Neta Lavi's cross was only half-cleared and Kanichowsky pounced to smash home. O'Hara then denied Yonatan Cohen with a finger-tip save but Ryan Sweeney should have kept his header on target from a corner by debutant Jordan Shipley. A much-improved second half performance by Ireland might have earned a penalty when Danny Kane was clearly hauled down in the box. Hale's introduction, however, provided the stimulus and he buried a shot past Assaf Tzur after the goalkeeper's free-kick landed straight at his feet. Chances fell to both sides, with Ronan Curtis going close and Mohammed Fani clipping the post at the other end. Israel then regained the lead after O'Hara came but didn't deal with Plakushchenko's cross, the ball painfully sailing into the corner. Right at the death, Cohen rubbed it in by skipping past a couple of players form Moti Barshazky's lay-off to add a third. ISRAEL: A Tzur; Y Meir, I Nachmias, A Bitton, Y Cohen; O Dasa (M Fani 65 mins), G Kanichowsky (M Plakushchenko 75 mins), N Lavi, M Barshazky (S Golan 87 mins), Y Cohen; S Weissman. IRELAND: K O'Hara (Macclesfield Town); C Whelan (Crewe Alexandraw), R Sweeney (Mansfield Town), R Delaney (Rochdale), D Kane (AFC Flyde); J Cullen (Charlton Athletic), L Kinsella (Walsall); H Charsley (Everton), R Greco-Cox (Crawley Town), R Curtis (Portsmouth); J Shipley (Coventry City). Subs: Ronan Hale (Derry City) for Shipley (59 mins), J Mulraney (Hearts) for Grego-Cox and J McGrath (Dundalk) for Delaney (both 85 mins).